We can supply a large number of Jeanneau Spares and After Sales support for many current and older Jeanneau models. Unfortunately we cannot supply Prestige spares and availability of parts for boats over fifteen years can be more difficult. Jeanneau are also unlikely to be able to supply replacement soft furnishings (curtains, upholstery etc.) for boats not in production. 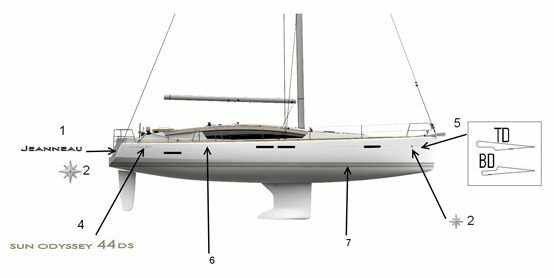 Some of the more common items are held in stock locally but many will need to be ordered from Jeanneau. This generally only takes a few days if the part is in stock at Jeanneau, however in order to keep delivery costs to a minimum, we often combine a number of customer orders together which may extend the lead times. If your delivery is urgent and you would like to pay extra for quicker delivery please advise at the time of enquiry. Please complete the enquiry form with your requirements providing as much detail as possible. The more information you can provide the easier it is for us to identify the correct part. It is sometimes impossible to supply the correct part without the Hull Number as parts often changed during production. Photographs can be emailed to spares@clarkeandcarter.co.uk. A member of our Jeanneau Spares & After Sales team will respond as soon as possible with either a quote or request for further details. Please note that we are unable to supply spare parts for Prestige motorboats, you will need to contact your local Prestige dealer to obtain these parts. Sorry for any inconvenience this may cause. For your convenience we can accept payment by cheque, bank transfer and PayPal. It is also possible to pay cash on collection from our premises. An excellent source of hints and tips for your Jeanneau, together with stories and articles by other Jeanneau owners can also be found at the Jeanneau Owners Network web site. Information on general maintenance tips can also be found on our maintenance tips page. Please fill in as many details about your boat and the part/s required below. Alternatively, if you want to send pictures or attachments, please email spares@clarkeandcarter.co.uk.